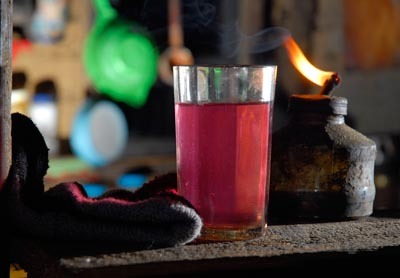 Were it not for this sweet pink elixir, I might very well have frozen my petunias that first night in Nepal. There is almost no firewood on the Nepal side of the trail that borders Singalila National Park on the Indian side. That’s because the Indian government prohibited villagers from cutting wood a few months back. The Nepal side of the border was stripped long ago, so now the people have no source of firewood. That means icy-cold nights and cookstoves fueled by gas. While I’m all for saving the trees, I whole-heartedly empathize with the villagers bundled in hats and blankets, shivering through months of winter. So there we were in Gairibas, barely a village on the edge of a military outpost, where the wind howled against the flimsy walls of an airy lodge. But our host, Diki Sherpa, rescued us when she hauled out a jug of rhododendron wine. In springtime, these flowers cover the Himalaya (98 percent of India’s rhododendrons grow in this area). So why not make use of all those pretty blossoms? The flowers are crushed with yeast and millet or rice, then cooked in a big pot. The juice slowly drips into a container. It’s something of a makeshift distillery. The wine tasted light and flowery upfront, with a hint of the kicky aftertaste you get in a serious rice wine. It was a good thing. I needed something warm that night. I’ve been in Taos skiing for the past few days and it’s been nice to revisit your blog upon returning home. I made a cup of hot tea, sat down, and went through all your posts that I’ve missed during the past week or so. What a treat! A cup of this wine sounds even better than tea though. I just love your blog — it has definitely become my favorite! Thank you, thank you! Bonnie, many thanks! I’ve just left a note on your blog. Melissa, Taos… that makes me think of far more comfortable places than where I am right now (more on that later). I’m glad you’re enjoying these posts so much. Thank you for reading!